Special 5-4 is the fourth level of Special 5 in Super Mario 3D Land. It is based off of World 3-5. The player starts off on a platform and must move to several moving platforms that are scrolling left. The platforms move over Brick Blocks, ? Blocks and Stingbies before leading to a platform that contains a Warp Box that warps the player to the next area. The next area is a vertical autoscroller and has the Checkpoint Flag. The platforms lead up to a platform that contains Flophoppers and soon after that a platform that contains a Warp Box. The final area contains two moving platforms that lead straight to the Goal Pole. Star Medal 1: On the moving platforms just before the platform with the Warp Box. 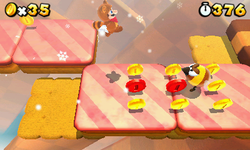 Star Medal 2: The second medal is floating above one of the cake platforms during the vertical scrolling segment. Star Medal 3: Floating above several moving platforms after the platform with the Flophoppers. This page was last edited on April 5, 2019, at 18:23.